Yahoo! may be on the verge of a sale, hostile takeover or the release of their Asian assets but that hasn’t stopped the company from moving forward with plans for new offerings in South Africa. 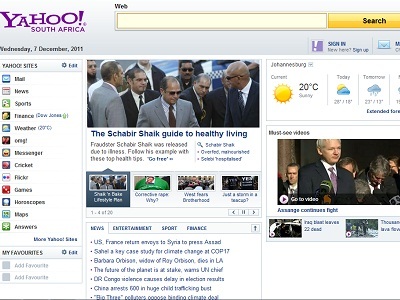 The company announced on Wednesday that they have finally re-launched a new Yahoo! homepage, new Yahoo! Mail service (with .co.za email addresses) and new Yahoo! News platform for the South African market. According to Yahoo! the new services will serve more than 2.6 million current South African users and provide advertisers with the opportunity to reach nearly two in every five South Africans. The population in the area is also growing at a rate of 20% per year, allowing for potential future growth as Yahoo! expands their services in the country. – New Yahoo! News: Yahoo! covers daily news, sports, finance, entertainment, science and tech through global partnerships with the likes of AP, Reuters and AFP as well as key South African publishers like TEAMtalk Media, the Mail & Guardian Online, The Daily Maverick and Memeburn. Do you think Yahoo! can make a larger dent in the South African market by re-launching their services with much needed improvements? It will be interesting to see what happens to this new property if the company sells off international assets.